With today's busy world, it's convenient to be able to carry data with you. 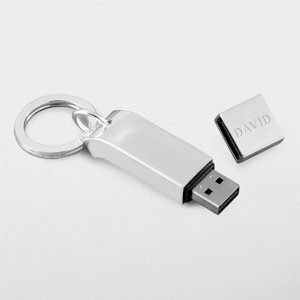 Our personalized 2 GB flash drive is a useful and elegant gift for data on the go! The silver plated flash drive can be hooked on a keychain, put in your pocket or carried in your purse. Perfect for students and executives, we event personalize it with up to 5 characters. Note - This item includes a personalization, color, size or design option: Name (e.g., First Name) (max of 5 characters) (Free of charge). You may specify this information during our checkout process.